Griswold Center Groundbreaking is a picture, with genre photograph. Its dimensions are 4 in. x 6 in.. It was created in October 1992. City of Worthington is the Creator. 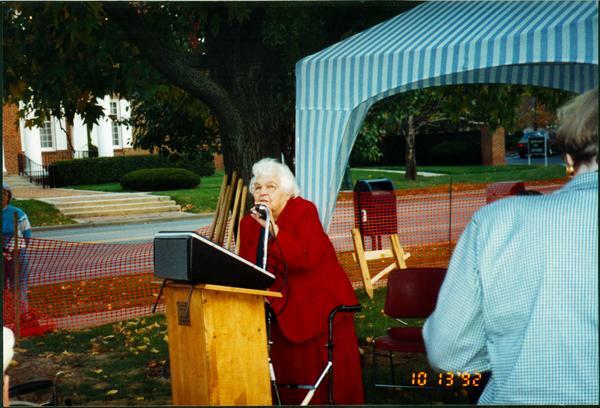 Myra Middleton spoke at the groundbreaking ceremony for the Griswold Center. She served as the President of the Worthington Seniors Club and was instrumental in the club becoming part of the Worthington Parks and Recreation Department. She was a strong advocate of senior involvement in the community. It covers the topics older people and recreation centers. You can find the original at City of Worthington. The Worthington Memory identification code is cow0024. This metadata record was human prepared by Worthington Libraries on August 25, 2003. It was last updated November 17, 2017.